Although fibroblast growth factor 19 (FGF19) can promote liver carcinogenesis in mice, its involvement in human hepatocellular carcinoma (HCC) has not been well investigated. FGF19, a member of the FGF family, has unique specificity for its receptor FGFR4. This study aimed to clarify the involvement of FGF19 in the development of HCC. We investigated human FGF19 and FGFR4 expression in 40 hepatocellular carcinoma specimens using quantitative real-time reverse transcription polymerase chain reaction (RT-PCR) analysis and immunohistochemistry. Moreover, we examined the expression and the distribution of FGF19 and FGFR4 in 5 hepatocellular carcinoma cell lines (HepG2, HuH7, HLE, HLF, and JHH7) using RT-PCR and immunohistochemistry. To test the role of the FGF19/FGFR4 system in tumor progression, we used recombinant FGF19 protein and small interfering RNA (siRNA) of FGF19 and FGFR4 to regulate their concentrations. We found that FGF19 was significantly overexpressed in HCCs as compared with corresponding noncancerous liver tissue (P < 0.05). Univariate and multivariate analyses revealed that the tumor FGF19 mRNA expression was an independent prognostic factor for overall and disease-free survival. Moreover, we found that the FGF19 recombinant protein could increase the proliferation (P < 0.01, n = 12) and invasion (P < 0.01, n = 6) capabilities of human hepatocellular carcinoma cell lines and inhibited their apoptosis (P < 0.01, n = 12). 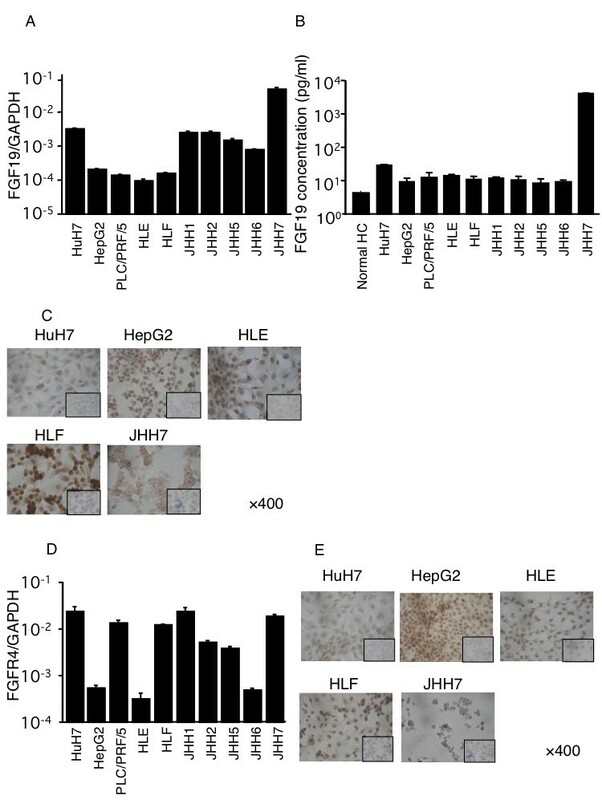 Inversely, decreasing FGF19 and FGFR4 expression by siRNA significantly inhibited proliferation and increased apoptosis in JHH7 cells (P < 0.01, n = 12). The postoperative serum FGF19 levels in HCC patients was significantly lower than the preoperative levels (P < 0.01, n = 29). FGF19 is critically involved in the development of HCCs. Targeting FGF19 inhibition is an attractive potential therapeutic strategy for HCC. Hepatocellular carcinoma (HCC) is a highly aggressive solid tumor associated with poor prognosis . Curative therapies of surgical treatment, including hepatic resection and liver transplantation, improve the chances of survival of patients with HCC [2–4]. However, a limited number of patients can be treated with surgery because of the damage to liver function. The prognosis for most patients remains poor after surgery for multicentric recurrence and intrahepatic metastasis [5, 6]. Therefore, the development of a systemic therapy that targets a new molecule involved in HCC is needed. Fibroblast growth factor (FGF) signaling plays an important role in a variety of processes, including proliferation, cellular differentiation, wound repair, and angiogenesis [7–9]. It has been reported that amplification or overexpression of FGFs is associated with the pathogenesis of malignant neoplasms, such as leukemias and sarcomas as well as stomach, pancreas, bladder, colon, breast, and prostate cancer [10–15]. Further, several correlations between overexpression, polymorphism, translocation, and truncation of FGF receptor (FGFR) and a variety of human neoplasms such as myeloma, breast, stomach, colon, bladder, and cervical cancer have also been reported [16–21]. Therefore, the FGF/FGFR system plays a critical role in tumor progression. FGF19 was first identified on the basis of its amino acid similarities to murine FGF15 (53% identity) . FGF19 is currently unique in displaying apparent specificity for FGFR4 [23, 24]. Previous studies have reported that FGF19 and hepatocyte FGFR4 regulate biosynthesis in the bile duct by repression of CYP7A1 . 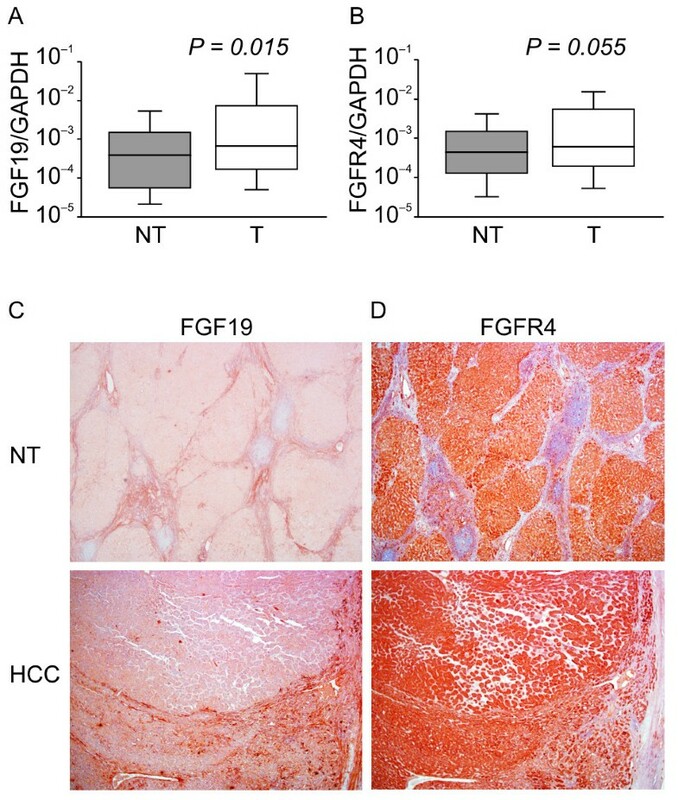 Further, FGF19 reportedly increases the metabolic rate, reduces body weight, and reverses diabetes in both high-fat-fed mice and leptin-deficient mice . On the other hand, ectopic expression of FGF19 in mice promotes hepatocyte proliferation, hepatocellular dysplasia, and neoplasia . Moreover, recent reports have revealed that a neutralizing antibody that selectively blocks the interaction of FGF19 with FGFR4 inhibits the growth of colon tumors and the formation of liver tumors in vivo . However, although the involvement of FGF19 in HCC has been demonstrated, no study has so far addressed the significance of FGF19 expression or clarified its role in the mechanism of HCC development in humans . In this study, we hypothesized that the FGF19/FGFR4 system is activated in patients with HCC and is correlated with the aggressiveness of the tumor. We elucidated the association between the FGF19/FGFR4 system and the development of HCC using human samples and in vitro experimental models. Cancerous tissues and surrounding non-cancerous hepatic parenchyma were obtained from 40 primary HCC Japanese patients who underwent curative resection surgery at Chiba University Hospital, Japan, from January 1995 to December 2001. They did not have any other malignancies. The ethics committee of Chiba University Hospital approved this study. Informed consent was obtained from every patient for the use of resected tissue before the study began. Samples were obtained from 31 men and 9 women aged 49-78 years. Specimens were histologically classified by the Japanese staging system of the Liver Cancer Study Group of Japan . In the corresponding noncancerous parenchyma, cirrhosis was found in 14 patients (35%). The human HCC cell lines HuH7, HepG2, HLE, HLF, PLC/PRF/5, JHH1, JHH2, JHH5, JHH6, and JHH7 were obtained from the Health Science Research Resources Bank (Osaka, Japan). HuH7, HepG2, HLE, HLF, and PLC/PRF/5 were cultured in Dulbecco's Modified Eagle's Medium containing 10% fetal bovine serum (Sigma-Aldrich Corp., St. Louis, MO). JHH1, JHH2, JHH5, JHH6, and JHH7 were cultured in William's Medium E with 10% fetal bovine serum. Primary cultures of human hepatocytes were prepared and cultured as described in previous papers . Total RNA from the cell lines and tissues was isolated using RNeasy Mini Kits (Qiagen, Hilden, Germany) according to the manufacturer's protocol. Specimens were taken from viable and non-fibrotic areas of tumors and noncancerous tissues. They were quickly frozen in liquid nitrogen and then stored at -80°C until use. Synthesis of cDNA from total RNA was conducted using a Ready-to-Go® cDNA synthesis kit (Amersham Biosciences Corp., Piscataway, NJ) following the manufacturer's protocols. The expressions of FGF19 and FGFR4 were examined by reverse transcription polymerase chain reaction (RT-PCR) with the following primers: (forward) (5'-TCT CCT CTG ACT TCA ACA GCG ACA C-3') and (reverse) (5'-TGT TGC TGT AGC CAA ATT CGT TGT C-3') for human GAPDH, (forward) (5'-CAG CTG TAC AAG AAC AGA GGC TTT C-3') and (reverse) (5'-AAA TGG GTC CAT GCT GTC GGT CTC C-3') for FGF19, and (forward) (5'-CAT CCG CTG GCT TAA GGA TGG AC-3') and (reverse) (5'-ATC ACG AGA CTC CAG TGC TGA TG-3') for FGFR4. All PCR reactions were performed using the SYBR Green PCR Core Reagents kit (Perkin-Elmer Applied Biosystems, Foster City, CA, USA) under the following conditions: 1 cycle at 95°C for 10 min, 50 cycles at 95°C for 10 sec, 60°C for 5 sec, 72°C for 10 sec, and 80°C for 1 sec. Real-time detection of the SYBR Green emission intensity was conducted with a LightCycler® (Roche, Mannheim, Germany). An equivalent amount of cDNA sample, derived from 40 ng total RNA, was used for each PCR reaction. The mRNA in each sample was then automatically quantified with reference to the standard curve constructed with each use of the LightCycler®. Quantitative RT-PCR was performed at least three times per sample. To standardize the amount of RNA, we quantified the expression of GAPDH mRNA in each sample and then divided the amounts of expressed FGF19 and FGFR4 mRNA by that of GAPDH. An immunohistochemical analysis was performed on paraffin-embedded sections using the Envision kit (Dako, Glostrup, Denmark) following the manufacturer's instructions. The sections were boiled in retrieval solution to expose antigens. Anti-FGF19 (R&D Systems, Inc., MN) monoclonal antibodies, anti-FGFR4 (Santa Cruz Biotechnology, Inc., Santa Cruz, CA) monoclonal antibodies and control antibody (R&D Systems, Inc., MN) were applied as the primary antibodies to the sections at a dilution of 25 μg/mL and 1:50. The section slides were counterstained with hematoxylin, dehydrated, and mounted. The immunostaining was evaluated independently by two pathologists. HuH7, HepG2, HLE, HLF, and JHH7 cells (1 × 104/well) were seeded and cultured at 37°C in a humidified 5% CO2 atmosphere for 24 h. Then, the cells were washed 3 times with phosphate-buffered saline (PBS) and fixed in 100% acetone for 10 min at 4°C. After fixation, cells were washed 3 times with PBS. Cells were blocked in blocking serum at room temperature for 1 h in a humidified chamber. Cells were washed 3 times with PBS and stained at the same dilution as paraffin-embedded sections. Cells were seeded (6 × 103/well) with FGF19 recombinant protein (Cell Sciences, MA, USA) at concentrations of 0.1, 1, 10, or 100 ng/mL and cultured. After 48, 72, or 96 h, 20 μL of Cell Titer 96® AQueous (Promega, WI, USA) was added to the culture media then incubated for 1 h at 37°C in a humidified 5% CO2 atmosphere. Then, the absorbance of each of the plates at 490 nm was recorded using a 96-well plate reader (Bio-Rad, CA, USA). The proliferation index (PI) was defined as OD values of the recombinant protein-treated cells divided by those of the untreated control cells. We examined proliferation assay with 12 chambers in the same condition at the same time. Cells were harvested at 48 h after seeding and incubation with 1 ng/ml of FGF19 recombinant protein. To initiate apoptosis, 5-fluorouracil (5-FU) (Roche) was added at a final concentration of 10 μg/mL. After further incubation and gravity sedimentation for 24 h, the supernatant was removed carefully and the cell pellets were resuspended in 200 μL lysis buffer. Then, ELISA was performed using the Cell Death Detection Kit (Roche) according to the manufacturer's specifications. The apoptosis index (AI) was defined as OD values of recombinant protein-treated cells divided by those of the controls. We examined apoptosis assay with 12 chambers in the same condition at the same time. Double-chamber transwell plates with 8-μm pore-size polycarbonate membrane inserts at the base of the upper chamber (Cell Biolabs, Inc., San Diego, CA) were used. Here, 300 μL of warm, serum-free media was added to each upper chamber and incubated for 1 h at 37°C. Upper chambers containing the reconstituted Matrigel membranes were set into the lower chambers of the 24-well cluster plates. JHH7 cells were trypsinized, counted, and resuspended with fresh medium before being plated into the upper chambers of the assay wells. Approximately 1 × 106 cells were plated in 300 μL of defined medium into each upper chamber. Then, 500 μL of medium was added to each lower chamber. Both the media in the upper and lower chambers contained 1 ng/ml of human recombinant FGF19. JHH7 were cultured in this way for 48 h in a humidified 5% CO2 atmosphere. The medium in the upper chamber was then aspirated, and cells from its inner surface were wiped off using a cotton swab. The membranes were stained with 400 μL of Cell Stain Solution and incubated for 10 min at room temperature. Stained inserts were gently washed several times with water. Then, the stained inserts were transferred to an empty well containing 200 μL of extraction solution and incubated for 10 min on an orbital shaker. Subsequently, 100 μL from each sample was transferred to a 96-well microtiter plate, and the OD 560 nm of each sample was measured in a 96-well plate reader (Bio-Rad, Hercules, CA). We examined invasion assay with 6 chambers in the same condition at the same time. Migration assay was performed by using transwell plates with 8 μm pore (BD Biosciences). JHH7 cells (1 × 105) suspended in 500 μl serum-free Williams medium were seeded into the upper part, whereas the lower compartment was filled with 1 ml medium with 1 ng/ml of the human FGF19 recombinant protein. After incubation for 24 h at 37°C in 5% CO2, non-migrating cells were removed from the upper surface of the membrane by scrub. Cells on the reverse side were stained with 0.1% crystal violet, and counted under a microscope at x100 magnification. We examined migration assay with 6 chambers in the same condition at the same time. Transfections of FGF19, FGFR4 and non-targeting negative control small interfering RNA (siRNA) (AMBION, Austin, TX) were conducted with Lipofectamine 2000 (Invitrogen, Carlsbad, CA) in 96-well plates according to the manufacturer's specifications. The day before transfection, the JHH7 cells were trypsinized, counted, and seeded at 6 × 103 cells per well into 96-well plates. Lipofectamine 2000 diluted in Opti-MEM (Invitrogen) was supplemented to the siRNA mixture. The mixture was incubated for 20 min at room temperature. The mixture and Opti-MEM were added to the plate to a final siRNA concentration of 20 nM. Control and FGFR4-specific siRNA were transfected into JHH7 as described above. At 72 h after transfection, the cells were collected and stained with either a phycoerythrin-conjugated anti-FGFR4 antibody (BioLegend, San Diego, CA) or an isotype-matched control (R&D systems, Minneapolis, MN). Flow cytometric analysis of cell surface FGFR4 was performed using a FACSCalibur analyzer (Becton Dickinson Immunocytometry Systems, San Jose, CA). Cells (6 × 103 per well) were seeded into 96-well plates, cultured for 24 h, and transfected with control, FGF19, or FGFR4 siRNA. At 72 h after transfection, cells were harvested. Then, 20 μL of Cell Titer 96® AQueous (Promega) was added to the culture media and incubated for 2 h at 37°C in a humidified 5% CO2 atmosphere. The absorbance of the plates at 490 nm was recorded using a 96-well plate reader (Bio-Rad). Cells (6 × 103 per well) were seeded into 96-well plates, cultured for 24 h, and transfected with control, FGF19, or FGFR4 siRNA. Cells were harvested at 72 h after transfection. To initiate apoptosis, 5-FU (Roche) at a final concentration of 10 μg/mL was added. After further incubation and gravity sedimentation for 24 h, the supernatant was carefully removed, and the cell pellets were resuspended in 200 μL lysis buffer. Then, ELISA was performed using the Cell Death Detection Kit (Cell Biolabs, Inc.) according to the manufacturer's specifications. Blood serum was obtained from 10 healthy subject and 29 primary HCC patients who underwent curative resection at Chiba University Hospital, Japan, from 2005 to 2007 (22 men, 7 women). The samples were obtained on the day before and the day after surgery. A sandwich ELISA kit was used for colorimetric detection of FGF19 in serum (FGF19 Quantikine ELISA kit, Minneapolis, MN) following the manufacturer's instructions. The relative mRNA expression levels (FGF19/GAPDH and FGFR4/GAPDH) were calculated from the quantified data. Mann-Whitney's U test was used to analyze the differences in the FGF19 and FGFR4 expression levels between HCCs and the corresponding noncancerous hepatic tissues. To analyze the correlation between FGF19, FGFR4, and clinicopathological parameters, differences in the numerical data between the two groups were evaluated using the Kruskal-Wallis test. Overall and disease-free survival rates were then calculated using the Kaplan-Meier method, and the differences in survival curves were analyzed using the log-rank test. Survival was counted if the patient was still alive or had died of other causes. Independent prognostic factors were analyzed by the Cox proportional hazards regression model in a stepwise manner. All the statistical analyses were performed using Stat View software (Version 5.0, Abacus Concepts, Berkeley, CA). Data are expressed as mean ± SE. P < 0.05 denoted the presence of a statistically significant difference. We examined 40 HCC samples and corresponding noncancerous hepatic tissues for FGF19 mRNA expression using real-time quantitative RT-PCR. The average FGF19/GAPDH level in HCCs was significantly higher than that in noncancerous tissues. (Figure 1A; P = 0.015), whereas FGFR4 was not significantly overexpressed in HCCs compared to noncancerous tissues (Figure 1B, P = 0.055). An immunohistochemical study using anti-FGF19 monoclonal antibodies was performed to determine whether FGF19 protein was expressed in HCC specimens. FGF19 protein was detectable in both cancer and noncancerous tissues Figure 1C). FGF19 staining was observed in the cytoplasm of tumor cells and noncancerous hepatocytes, and tended to be greater in the tumor cells. FGFR4 staining was not significantly greater in the membranes of tumor cells as compared to those of cells from corresponding noncancerous tissue (Figure 1D). Real-time quantitative RT-PCR analysis, immunohistochemical staining of representative specimens from HCC patients of 40 HCC samples. (A): Ratio of average FGF19/GAPDH expression in HCC (T) compared with corresponding noncancerous hepatic tissues (N). The average FGF19/GAPDH level in HCCs. (B): The average FGFR4/GAPDH level in HCCs. (C): Immunohistochemistry using anti-FGF19 monoclonal antibodies; HCC tissue (lower) and noncancerous hepatocytes (upper). (D): Immunohistochemistry using anti-FGFR4 monoclonal antibodies; HCC tissue (lower) and noncancerous tissue (upper). (Original magnifications: ×40 (upper); ×40 (lower)). RT-PCR; reverse transcription polymerase chain reaction; HCC, hepatocellular carcinoma. The correlation between FGF19 expression and clinicopathological parameters in patients with HCC is shown in Table 1. Significant correlation was found only between FGF19 mRNA expression and pathological stage. (Table 1, P = 0.049). For statistical analysis of FGF19 levels, the specimens were divided into two groups based on the median value of tumor FGF19 mRNA (5.7 × 10-4): a high expression group (n = 20) and a low expression group (n = 20). We analyzed disease-free survival rates and overall survival rates to assess the prognostic significance of FGF19. The 5-year disease-free and overall survival rates of the 40 patients with HCC were 10% and 40%, respectively. Using the Kaplan-Meier curve assessment, we found that patients with higher FGF19 expression levels had lower 5-year survival rates than patients with lower FGF19 expression levels (disease-free survival rate, 0% vs. 20%; P = 0.0061; overall survival rate, 20% vs. 60%; P = 0.0046; as shown in Figure 2). To evaluate the potential of using FGF19 expression in determining the postoperative prognosis of HCC patients, univariate analysis using a Cox proportional hazard regression model was conducted (Table 2). The results showed that the serum AFP index, FGF19 mRNA level, and intrahepatic metastasis were significant predictors of disease-free survival (P = 0.004, 0.021, and 0.020, respectively), while Milan criteria, serum AFP index, FGF19 mRNA level, tumor size, and intrahepatic metastasis were significant predictors of overall survival (P = 0.006, 0.042, 0.018, 0.028 and 0.020, respectively). Multivariate analysis was conducted with 5 prime variables that are regarded as prognostic factors for patients with HCC in previous studies because of the small sample size of patients (Table 3). A high FGF19 mRNA level remained significant in both disease-free survival and overall survival, and was the strongest in overall survival (P = 0.040 and 0.003, odds ratio = 2.34 and 3.61, respectively). Survival rates of 40 patients with HCC. (A) Disease-free survival rates of patients with HCCs. (B) Overall survival rates of patients with HCCs. High expression of FGF19 mRNA was significantly associated with poorer prognosis. We used RT-PCR to analyze the differential expression of FGF19 by measuring mRNA levels among 10 HCC lines. FGF19 mRNA was expressed in all HCC lines, and at a remarkably higher level in JHH7 (Figure 3A). FGF19 protein was detected using an FGF19 ELISA kit in culture media for all human HCC lines and normal hepatocyte at 72 h after seeding; FGF19 was noted to be significantly higher in JHH7 cells and significantly lower in normal hepatocyte (Figure 3B). An immunocytohistochemical study using anti-FGF19 monoclonal antibodies was performed to determine whether FGF19 is expressed in all HCC lines; FGF19 protein was detectable in all HCC lines in the cytoplasm (Figure 3C). Similarly, FGFR4 mRNA was expressed in all HCC lines (Figure 3D). Through FGFR4 staining, FGFR4 protein was observed in all HCC lines (Figure 3E). (A) FGF19 mRNA expression in cell extracts from HuH7, HepG2, PLC/PRF/5, HLE, HLF, JHH1, JHH2, JHH5, JHH6, and JHH7 cell lines was examined using quantitative RT-PCR ( n = 8). FGF19 was expressed in all cell lines. (B) FGF19 protein levels in the supernatant media from ten cell lines and normal hepatocytes (normal HC) were assayed by ELISA. FGF19 was detected in the supernatant of all of them. (C) Using anti-FGF19 monoclonal antibodies, diffuse positive staining was demonstrated in the cytoplasm of HuH7, HepG2, HLE, HLF, and JHH7 cells. The closed rectangles indicate the same cells stained Immunohistochemically using control antibody. (D) FGFR4 mRNA expression in cell extracts from HuH7, HepG2, PLC/PRF/5, HLE, HLF, JHH1, JHH2, JHH5, JHH6, and JHH7 cell lines was examined using quantitative RT-PCR (n = 8). FGFR4 was expressed in all cell lines. (E) Using anti-FGFR4 monoclonal antibodies, positive staining was demonstrated in the cell membranes of all of the above HCC lines. (Original magnifications (C) × 400), (E) × 400)) The closed rectangles indicate the same cells stained Immunohistochemically using control antibody. We chose the HuH7, HepG2, HLE, HLF, and JHH7 cell lines upon consideration of the combination of FGF19 and FGFR4 levels. We cultured these HCC lines with FGF19 recombinant protein at concentrations of 0.01, 0.1, 0.5, 1, 5, 10, 50, or 100 ng/mL and performed a proliferation assay (Figure 4A; n = 12, P < 0.05). We found that the proliferation of all HCC cells examined increased significantly upon addition of FGF19 recombinant protein at concentrations of 0.01-10 ng/mL over 48-96 h (Figure 4B). The proliferation index was highest when the concentration of FGF19 was 1 ng/mL in the 5 HCC lines, whereas apoptosis of HCC cells was significantly suppressed by addition of 1 ng/mL FGF19 recombinant protein in culture media (Figure 5A; n = 12, P < 0.05). Tumor metastasis is still a major problem in management of cancer. In order to investigate further whether FGF19 plays an important role in tumor metastasis, the invasion assay and migration assay were performed. Invasion assays were used to investigate the alteration of cancer cell invasiveness in the presence of FGF19 recombinant protein for JHH7. 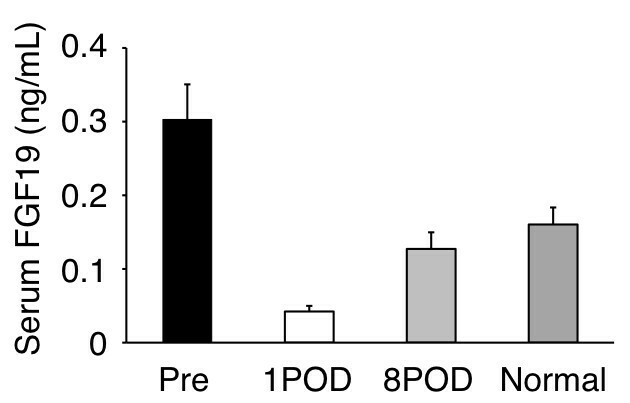 The assays were conducted by staining and measuring the OD at 560 nm; they revealed that 1 ng/mL of the FGF19 recombinant protein significantly increased the mobility and invasiveness of the JHH7 cells (Figure 5B; n = 6, P < 0.05). As shown in Figure 5C, the number of migrated cells also increased dramatically after addition of the FGF19 recombinant protein (Figure 5C; n = 6, P < 0.05). Results of the invasion assay and migration assay indicate that FGF19 may be an activator of tumor metastasis. (A) Proliferation changes after addition of various concentration of the FGF19 recombinant protein. (B) The proliferation index (PI) was defined as the OD values of cells treated with recombinant protein divided by those of untreated cells. The PI increased after addition of FGF19 recombinant protein (0.01-10 ng/mL final concentration) to culture media and culturing for 96 h. PI, proliferation index. (A) Apoptosis assay at 72 h after FGF19 recombinant protein treatment. (left) 5-FU treatment; (right) 5-FU and recombinant protein treatment. The apoptosis index (AI) was defined as the OD values of cells treated with these agents divided by those of untreated cells. (B) (upper) Invasion assay after FGF19 recombinant protein treatment (100× magnification). (lower) Invasion assay 48 h after FGF19 recombinant protein treatment after FGF19 recombinant protein treatment. (C) FGF19 enhanced cell migration ability in JHH7 cell line. The transwell system was used to evaluate migratory ability. Migrated cells were counted and the quantitative results are shown (n = 6). The data presented are from a representative experiment, being quantitatively similar in the replicate experiments. We selected the JHH7 cell line for further studies because this HCC line showed the highest FGF19 expression at both the mRNA and protein levels in the 10 HCC lines examined. Transfection of FGF19 siRNA decreased FGF19 mRNA expression by 72% after 48 h as compared with cells transfected with control siRNA (Figure 6A). Maximum downregulation of FGF19 protein occurred at 72 h after transfection. The FGF19 protein was downregulated by more than 90% in the JHH7 cells (Figure 6B). Similarly, FGFR4 siRNA transfection downregulated mRNA (Figure 6C) and protein expression of FGFR4 (Figure 6D). Further, proliferation of JHH7 cells was significantly suppressed by FGF19 siRNA transfection (Figure 6E; n = 12, P < 0.05) and FGFR4 siRNA transfection (n = 12, P < 0.05). We also found that apoptosis induced by 5-FU increased significantly in the FGF19 siRNA group at 96 h after transfection (Figure 6F; n = 12, P < 0.05) and FGFR4 siRNA transfection (n = 12, P < 0.05). Suppression of FGF19 expression was confirmed at transcript level by RT-PCR. (A) and at protein level by ELISA analysis (B). Analysis was performed at 48 h and 72 h following siRNA transfection for mRNA and protein level, respectively. 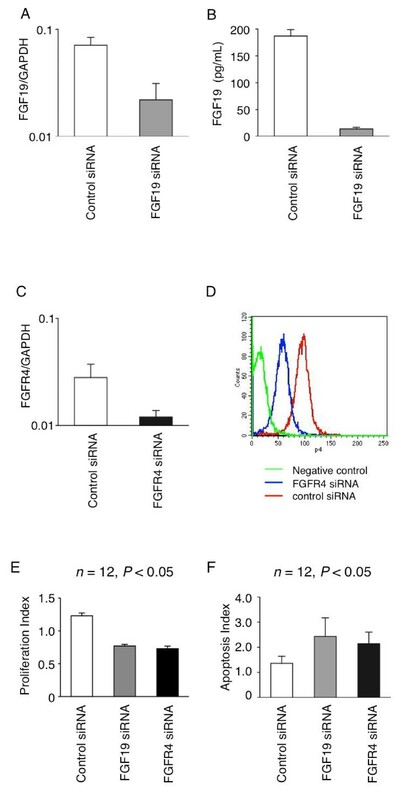 FGF19 mRNA expression was suppressed to 30% of control siRNA in FGF19-specific siRNA-treated cells. n = 12, P < 0.05 at top of the Figure 6A, 6B, and 6C (like figure 6E and 6D). FGFR4 gene silencing by siRNA. Suppression of FGFR4 expression was confirmed at transcript level by RT-PCR (C) and at protein level by flow cytometry (D). Analysis was performed at 48 h and 72 h following siRNA transfection for mRNA and protein levels, respectively. FGFR4 mRNA expression was suppressed to 40% of control siRNA in FGFR4-specific siRNA-treated cells. n = 12, P < 0.05 at top of the Figure 6A, 6B, and 6C (like figure 6E and 6D). (E) Proliferation assay in JHH7 cells at 72 h after FGF19/FGFR4 siRNA treatment. (F) Apoptosis assay in JHH7 cells at 96 h after FGF19/FGFR4 siRNA treatment. PI, Proliferation Index. AI, Apoptosis Index. Serum FGF19 levels were measured at the pre- and postoperative period. Serum FGF19 levels of 10 normal subject were also measured. Postoperative FGF19 levels were significantly lower than those in the preoperative period (Figure 7; n = 29, P < 0.05). Moreover, FGF19 levels in the normal subjects were significantly lower than those in the preoperative period and significantly higher than those in the postoperative period (Figure 7, P < 0.05). The changes in serum FGF19 levels, as measured by ELISA, of the 29 patients with HCCs from 1 st day and the 8 th day after curative resection surgery. Normal shows serum FGF19 levels of the 10 health subjects. In this study, we clarified the association between the FGF19/FGFR4 system and the development of HCC using human samples and in vitro experimental models. FGF19 was expressed at significantly higher levels in HCCs, whereas the receptor FGFR4 was expressed in noncancerous tissue and HCC at similar levels. Han Kiat Ho et al., reported that one third of HCC patients exhibited increased FGFR4 mRNA expression in the matched tumor/normal tissue . In our study, FGFR4 mRNA expression showed no significant difference but increased tendency (Figure 1B, P = 0.055) in cancer tissue compared with adjacent tissue. Therefore we believe that there is no confliction between the both reports. Further, serum FGF19 significantly decreased after curative hepatectomy. Therefore, FGF19 appears to function in an autocrine or paracrine fashion. FGF19 mRNA expression was correlated with prognostic significance for the survival of patients with HCC. Thus, this is the first report showing the clinical importance of FGF19. These in vitro studies revealed that recombinant FGF19 could induce proliferation, stimulate invasion, and inhibit apoptosis in HCC lines. Inversely, the introduction of FGF19 and FGFR4 siRNA was able to reduce proliferation and increase apoptosis in HCC lines. These findings suggest that the FGF19/FGFR4 system plays a critical role in HCC progression. The mRNA expression levels of FGF19 and FGFR4 in HCC have been shown as 46% and 60%, respectively, by in situ hybridization . In our study, all the examined human samples expressed both FGF19 and FGFR4 mRNA and the corresponding proteins. Further, all the cell lines examined expressed both FGF19 and FGFR4 at the higher level than normal hepatocyte. These results suggest that FGF19/FGFR4 are generally expressed in HCC. We investigated the correlation between FGF19 expression and the clinicopathological parameters in HCC. Our data indicated significant correlation in our cohort between FGF19 expression and pathological stage. The reason why FGF19 had no significant correlation with other prognostic factors, such as tumor size and vessel invasion, may be the small number of samples included in this study. Univariate and multivariate analyses revealed FGF19 to be an independent prognostic factor in HCC patients. These results indicate that high levels of FGF19 might help to identify HCC patients with poor prognoses and that FGF19 could be a novel prognostic marker of HCC. However, the detailed mechanism by which high levels of FGF19 contributes to the poor prognosis of patients with HCC must be elucidated by further study. However, we consider that FGF19 is certainly involved in the progression of HCC because recombinant protein and siRNA transfection were capable of affecting proliferation, invasion, and apoptosis in the experimental models. Previous multivariate analyses have identified several variables as independent predictors of patient prognosis (tumor size, number of lesions, portal vein invasion, etc.) in patients who were not treated surgically and in those who underwent surgical resection. Further, a number of molecular markers with prognostic significance have been identified in HCC . In this study, we showed that FGF19 is a novel independent prognostic factor for both disease-free and overall survival (Table 3). Moreover, serum FGF19 levels significantly decreased in HCC patients after curative operations (Figure 7). The sensitivity of serum FGF19 renders it a promising tumor marker for HCC. These results strongly indicate that FGF19 in surgically excised HCC tissues or preoperatively in the blood serum might help to identify patients with aggressive disease who will need adjuvant therapy. In this study, we examined whether the introduction of siRNA into HCC cell lines could suppress the proliferative and anti-apoptotic properties of the HCC cell lines in vitro. FGF19 siRNA successfully suppressed FGF19 mRNA and FGF19 protein expression in the high FGF19-expressing cell line JHH7. Further, the proliferative and anti-apoptotic properties of JHH7 were lost in vitro after FGF19 siRNA transfection. Transfection of FGFR4 siRNA showed similar results. Recently, Desnoyers et al. have reported that neutralizing antibody of FGF19 treatment significantly suppressed the growth of established colon cancer tumors in vivo . RNAi has been effectively used in target-directed therapies in a range of diseases and in the silencing of tumor genes by systemically administered siRNA in vivo [33–35]. Likewise, with antibody treatment, FGF19 and FGFR4 siRNA also may be potential targets for systemic therapy for HCC. In conclusion, our results demonstrated that FGF19 expression was significantly upregulated in HCCs, with higher expression being correlated with poor prognosis. Our results raise the possibility for potential treatment strategies aimed at functional abrogation of FGF19 that provide new therapeutic approaches in the management of HCC. SM participated in the study design, carried out the in vivo experiments and evaluation of immunohistochemical staining, and drafted the manuscript. NM participated in the study design and helped to draft the manuscript. HS and FK coordinated and performed the statistical analysis and helped to draft the manuscript. HY and MO participated in the study design. AK, TS, and DO carried out in vitro experiments and performed statistical analysis. MM participated in the study design, carried out evaluation and validation of immunohistochemical staining, and helped to draft the manuscript. All authors have read and approved the final manuscript.